The House Democratic budget plan does not include any provisions affecting the pay or benefits of federal employees, a top lawmaker confirmed Tuesday. 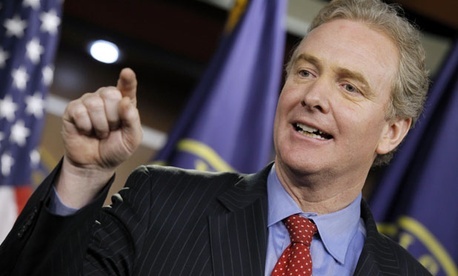 Maryland Democrat Chris Van Hollen, whose district includes many federal workers, said there is nothing in the House Democratic budget blueprint that would modify the compensation of government employees -- a key difference from the Republican plan unveiled by Wisconsin Rep. Paul Ryan and narrowly approved last week by the Budget Committee. Ryan is chairman of that panel, and Van Hollen, who released the Democrats’ alternative to the Republican proposal Monday night, is the committee’s ranking member. In their fiscal 2013 budget plan -- similar to their 2012 document -- House Republicans suggested extending the federal pay freeze through 2015, cutting the size of the federal workforce by 10 percent and increasing employee contributions to retirement plans. “We are going to fight the Republican proposals to single out and scapegoat federal employees,” said Van Hollen, after joining Minority Whip Steny Hoyer, D-Md., on Tuesday at Hoyer’s weekly briefing with reporters on Capitol Hill. Van Hollen said during the briefing that House Democrats used President Obama’s fiscal 2013 budget request as a framework for their plan, but it does not include all the administration’s provisions and leaves many specifics up to the discretion of congressional committees. Obama’s budget proposal calls for a 0.5 percent pay raise for federal workers in 2013 and recommends increasing the amount federal employees contribute to their government pensions by a total of 1.2 percent over three years beginning in 2013. Under payroll tax cut legislation signed in February, new employees hired after Dec. 31, 2012, and those rehired after that date with less than five years of service will have to pay 2.3 percent more toward their pensions, making their total defined benefit plan contributions 3.1 percent of their pay. House Democrats’ budget plan also would cancel the governmentwide automatic spending cuts known as sequestration scheduled to take effect beginning in 2013, replacing them with “greater deficit reduction from targeted spending cuts and revenue increases.” The GOP plan, which estimates saving a total of $368 billion over the next decade, would relieve the Defense Department from significant budget cuts resulting from sequestration. Other groups are floating their version of a fiscal 2013 budget blueprint, including the conservative Republican Study Committee. That group is proposing freezing discretionary spending below fiscal 2008 levels, requiring federal workers to pay more toward their retirement, switching to what's known as the "chained Consumer Price Index" formula to determine cost-of-living adjustments for federal retirees, and slowing the growth of government contributions to the Federal Employees Health Benefits Plan. The RSC proposal, however, does not specifically mention extending the federal pay freeze. Hoyer said the House will take up the budget proposals this week, likely Wednesday and Thursday. The minority whip also said he hopes the chamber will move this week on the Senate-passed version of the transportation package which does not include an extension of the federal pay freeze despite an attempt to add one. The legislation, however, does contain language that would allow retirement-eligible federal employees to work part time to help pay for other government programs, and federal employee unions oppose that language on principle. Under the bill, part-time employees would receive partial annuities and could earn additional retirement benefits proportional to the amount of time they work. The House-approved transportation bill includes several provisions that would affect current government workers’ pay and benefits, including an increase in the amount they contribute to their pensions.